REDDING, Calif. (AP) — Jim Chapin had dined out after work Thursday, confident that a distant wildfire would not reach his neighborhood while he was away. But when the 79-year-old Redding, California, resident got home around 7:30 p.m., police were telling people to hurry up and go. Chapin’s wife gathered prescriptions and the dogs and left. He stayed behind to hose down the roof and fallen leaves. A half-hour later, fire was burning trees behind his neighbors’ homes and winds were whipping branches, burning leaves, garbage can lids and other debris. He feared he would be hit in the head. He jumped in his car and almost immediately was in gridlock. Drivers honked, jumped the curb and cut off other cars. There was no way for firefighters to get into the Lake Redding Estates subdivision, which has just one way in and out. Chapin was among thousands to flee the deadly Carr Fire that exploded Thursday night, jumped the Sacramento River and raced into the western outskirts of Redding, a city of about 92,000, about 100 miles (160 kilometers) south of the Oregon border. 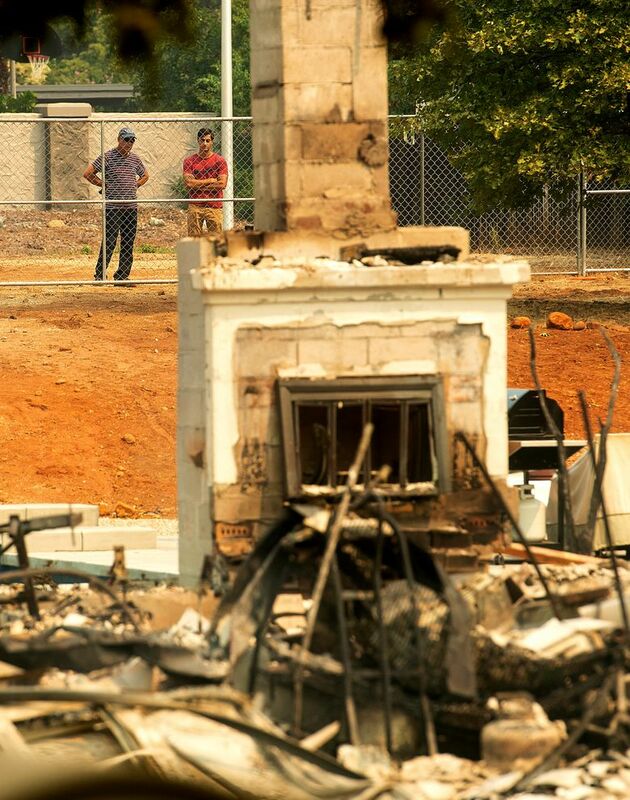 In Chapin’s neighborhood of about 700 residents, an Associated Press reporter counted 66 destroyed homes. The fire in rural Shasta County turned so quickly that a reporter at KRCR-TV in Redding choked up as she reported live on the devastation before the station had to go off air. Journalists at the Record Searchlight newspaper tweeted they were reporting without electricity. Some people had time to pack up belongings, even helping neighbors load up vehicles and say goodbye. They gathered a wedding dress, handmade quilts made by a grandmother and pets. Other departures were more hurried and many reported clogged roads. “One of the things we love about living in Redding is there’s no real traffic, so to be bumper-to-bumper on these little streets we zip up and down most times is pretty surreal,” said Kim Niemer, community services director with the city’s recreation department. Niemer had the foresight Thursday to collect family mementos, papers and her grandmother’s quilts. 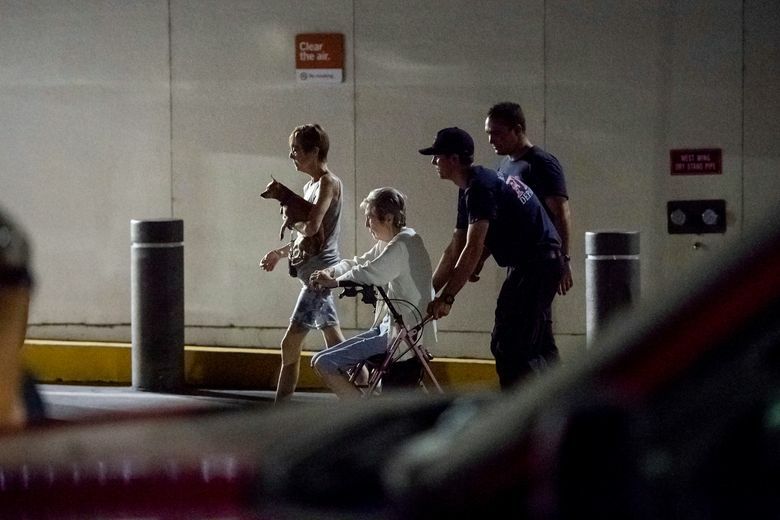 She left around 9 p.m., an hour before an evacuation notice was issued, and joined a line of vehicles, some carrying boats and RVs. Anna Anderson left shortly after Niemer did, but her departure was more rushed. 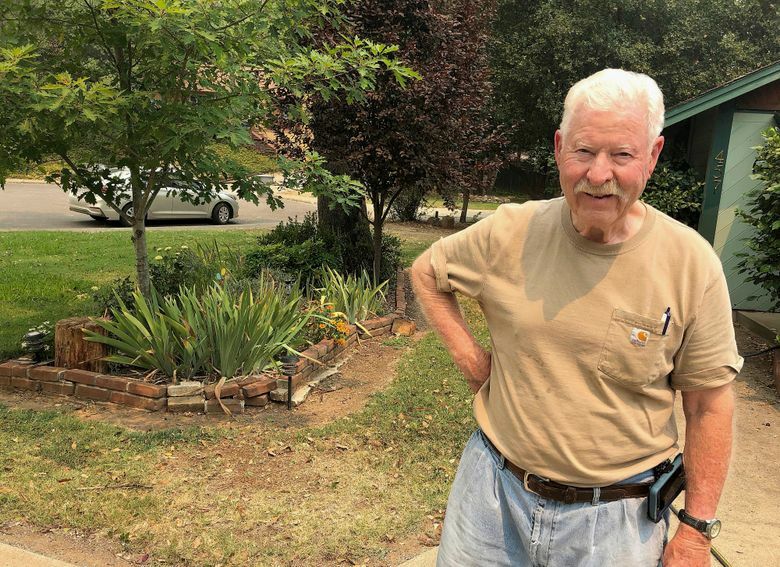 When she heard a highway patrol officer holler, “this is mandatory evacuation, you must leave!” through a megaphone, the Redding resident knew it was time to go. Anderson, her parents, and two teenage children raced around their four-bedroom house to gather their belongings. Outside, fierce winds blew ash into their eyes as they packed up the car with their two cats, clothes and pictures. They spent the night on the floor of the Redding Church of Jesus Christ of Latter-day Saints. “Fires happen a lot here, but this is the closest that it’s ever gotten for us,” said Anderson, 36, a clerk at the Superior Court of California in Shasta County. The family was able to check their still-standing house Friday. They watched as firefighting planes flew directly overhead. As they left for a second time around noon, the National Guard had arrived. “I went through it again, crying my eyes out, leaving again,” she said. On Thursday morning, west Redding resident Alayne Rodriguez received a call at work from her husband, Rafael, that their apartment complex was being evacuated. It turned out to be faulty information, but it gave the couple warning. With the fire edging closer, they fetched their Goldendoodle, Jack, and packed the car with computers, legal documents and a few photo books. Rodriguez, 26, grabbed the dress she wore at their 2014 wedding. They helped neighbors pack and left shortly after 7 p.m., not even half an hour before her neighborhood received its order to evacuate. “Because the fire spread so quickly, it added a tinge of panic to our decision making,” Rodriguez said. Chapin returned to hard-hit Lake Redding Estates on Friday and cried when he found his home still standing. “I thank the man upstairs for that,” Chapin said. Gill reported from San Francisco. AP reporter Janie Har contributed from San Francisco.